This recipe comes from the diet and calorie count chapter, I’m not really on a diet but not sure this counts as a low calorie meal! I guess it’s low sugar, high complex carbs, protein and saturated fat, so if that’s the type of diet you’re on then this is one to try!! I had a bag of mixed nuts so blitzed up 4oz of that..
Then added the parsley, onion and seasonings..
Then the cooked rice is added along with the egg and tomato sauce..
It’s all a bit wet so not easy to shape.. I had to use the tea towel to help shape into a sausage and then tied the ends.. This went into a big pot and I opted to have it simmering in some chicken stock, not sure if that will make much of a difference! 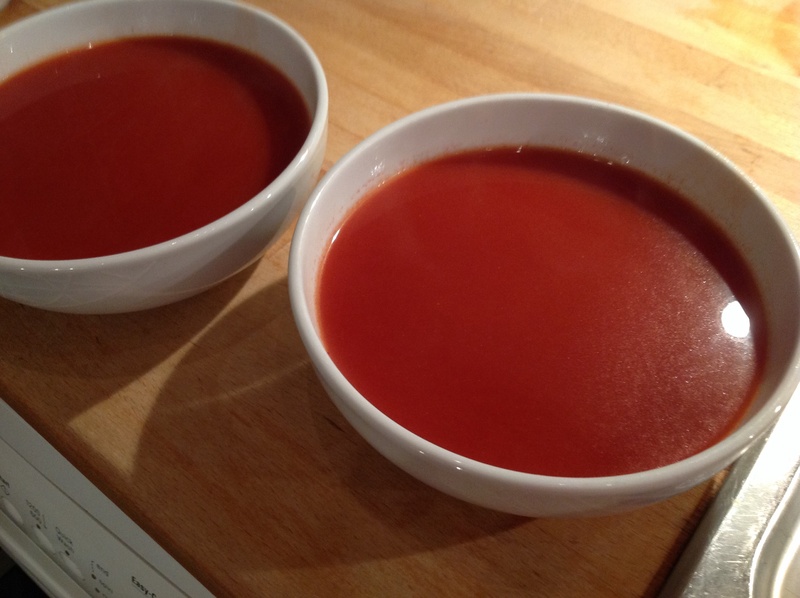 While that was simmering I made a basic tomato sauce; garlic, onion, tomatoes, stock herbs and seasoning. It was left to simmer for half an hour and then blended. So after an hour and a half I removed the roll from the pan. I managed to actual unroll it quite successfully, but it just doesn’t look very appealing..
Looks a bit better with the tomato sauce poured over.. I think my husband and daughter are now used to coming to the dinner table and seeing something a little unusal! I expected a few remarks on this looking awful but was quite surprised when neither of them had any objections to this!! I just served each of us with a slice of this with sauce poured over, it may not look like much but it’s really filling..
It’s packed with the rice and nuts and is actually quite nice! I do think the fact that the sauce is really good does help, I’m not sure how much I could’ve managed with no sauce! 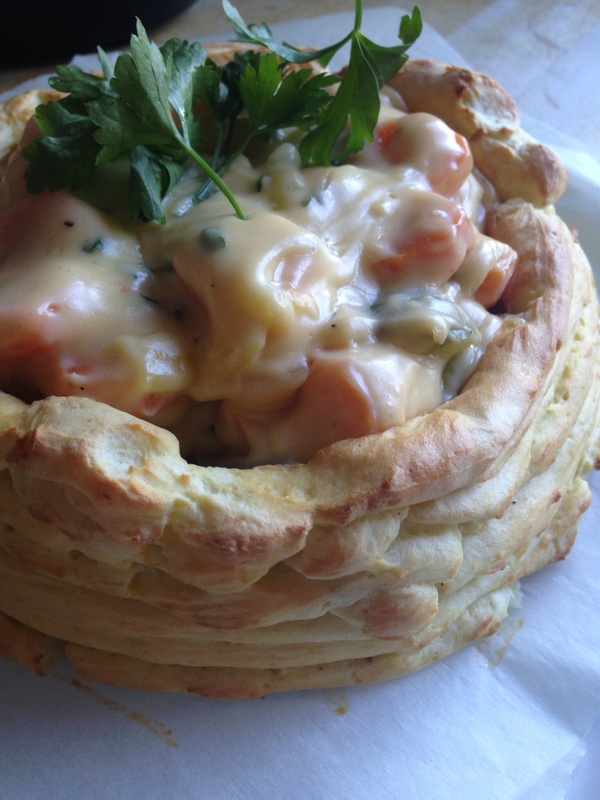 We all polished off this one and there’s plenty left for lunch tomorrow..
Would I make this again? Yes, would try adding a few more different herbs or veggies next time.. I only had 2lb of potatoes left so I decided to half this, plus 4lb does seem like an awful lot of potatoes! It doesn’t give an amount of veg so I just used what I had left, and that was carrots, peppers and spring onions! I was going to go buy some cauliflower at lunchtime but felt that defeated the purpose of making this! Have to say one of my least favourite jobs in the kitchen in mashing potatoes, so there is definitely a good few lumps in my mash! 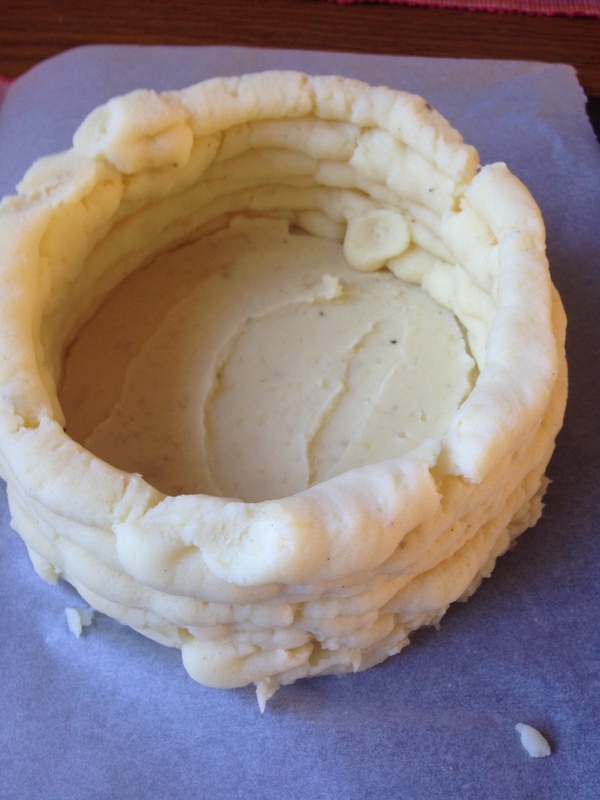 I do like the whole adding the egg to mashed potato before baking, it really does make such a difference! So I had to get my piping bags out for this, so it’s just as well I have loads of them in the house! If you don’t have any you can make one by folding greaseproof paper and then snipping the corner off. As you can see there are a few cracks so I was hoping it would hold ok in the oven. Once this was on I made a cheese sauce in the usual way and I just boiled the veg till softish. 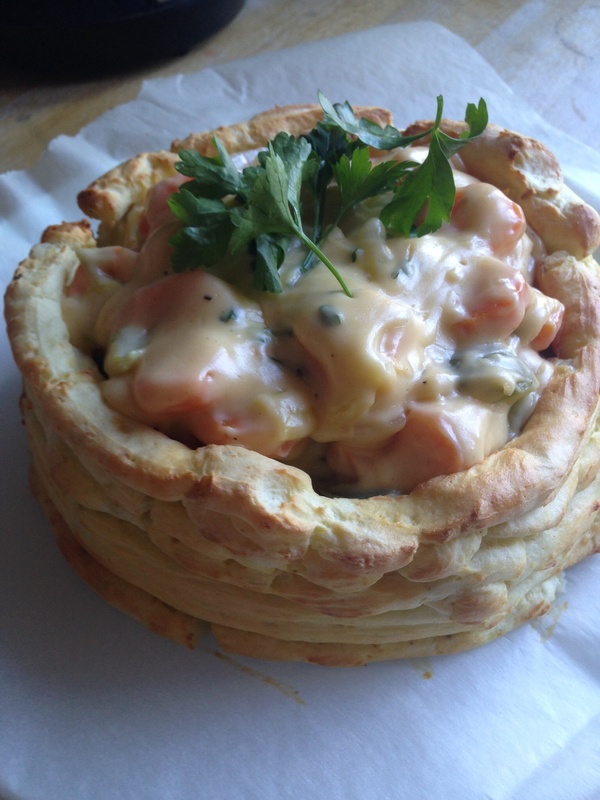 I also opted to put some chopped parsley through the cheese and veg mix. I know my filling isn’t that exciting as it’s predominantly carrots, but I think most things coated in a cheese sauce are good! 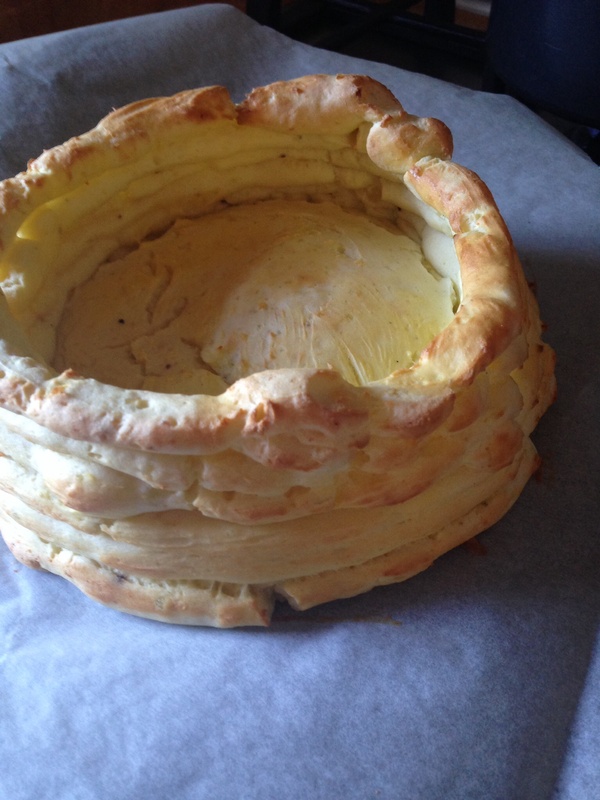 Once filled I think this looks like a giant vol-au-vent! We just had this with some salad in keeping with the diet control idea! It is quite soft but I still managed to cut up without totally collapsing! Even though I halved this it makes loads and was more than enough for the three of us for dinner, and that is a lot considering all we had with this was some salad leaves. The potato is lovely and soft inside but with a nice crisp outside. 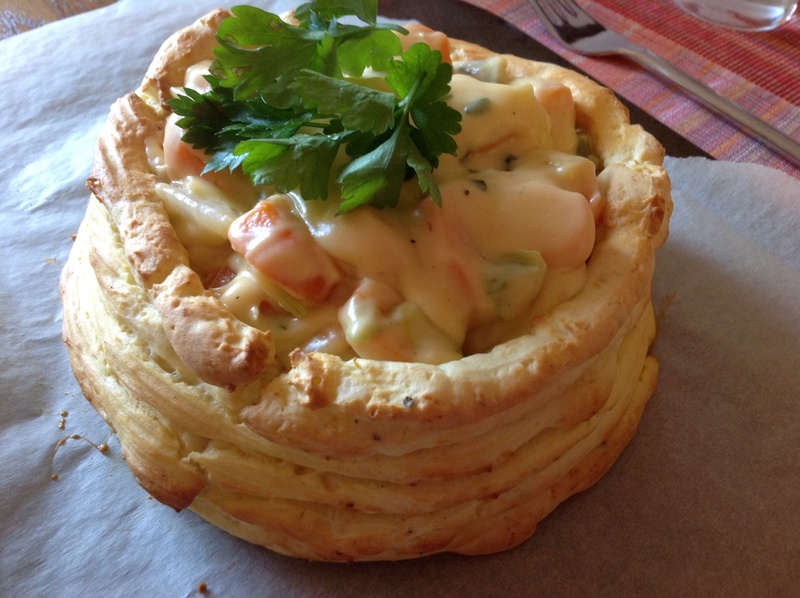 The filling is good, I do love cheese sauce so maybe added a bit more cheese than a recipe would recommend but it’s really good! So it’s mainly carrots with a few spring onions and a pepper, but they are all just soft enough and coated in the lovely cheesy sauce! Overall it’s a great dinner. It’s really filling and like I said its a good way to finish off the weeks veg. Am not sure what sort of diet it fits in with but I don’t care because I really enjoyed this, and even my daughter loved this and finished off every last drop off her portion. I really didn’t fancy anymore egg but thought for the last day I should at least have one of the suggested meals. I know I keep going on about how I don’t like eggs and how I’ve not been enjoying the sheer volume of eggs I’ve had this week, but I would like to challenge anybody to try eat something they don’t like pretty much every day for a week! After this week I am not having an egg in any of its basic formats for a very long time. The diet is set out into days and this last day is actually under the Sunday heading, so I guess this would be a good Sunday lunch if you were cooking for few. It was just me and my daughter so I wasn’t roasting any beef just for us! So I did kind of stick to this, I had bought ready cooked roast beef but I served it with spinach, which is now finally finished, and horseradish sauce. Just had cheddar on my crackers and then I don’t think I have had a full glass of milk to drink since I was about 12! It was strangely refreshing! I didn’t take a picture of anything today, mainly because it just looked rubbish, I know that’s not stopped me all week but I really felt so un motivated by today that I simply wasn’t interested in posting more terrible photos! So overall this has not been the most enjoyable week food wise for me. I actually think I’ve overdosed on eggs. There have been a few highlights; the marrow and baked apple were good and then the soufflé was excellent. As a diet I suppose it’s not too bad, when you break it done it is quite a good variety of dishes. It’s just difficult to stick to such an exact menu. So have I lost weight? Yes I have actually. I had cut out wine (and all other alcohol), chocolate, crisps and cake for the entire month and then have been sort of doing this diet. Over the last week I have lost a couple of pounds and over the last month I have lost 6 pounds. So roll on December and all the baking treats that brings! Would I do this diet again? Not likely! Day 6 starts with an egg free breakfast much to my delight! Really not very much to say about this apart from this is more like normal breakfast for me. No advise on quantity but an average bowl of cereal should be 30g. I weighed out 30g of cereal and it’s tiny! Think my portion was more like 50g. I didn’t have any of these for lunch. I was going to make soused herrings as there is a recipe for that but I just didn’t have time. I really want to try them so I will make another day. I did buy rollmop herrings which are similar I think? Rather than have for lunch I had then as a starter for dinner. They were brill, so I’m now really looking forward to making the soused herrings. 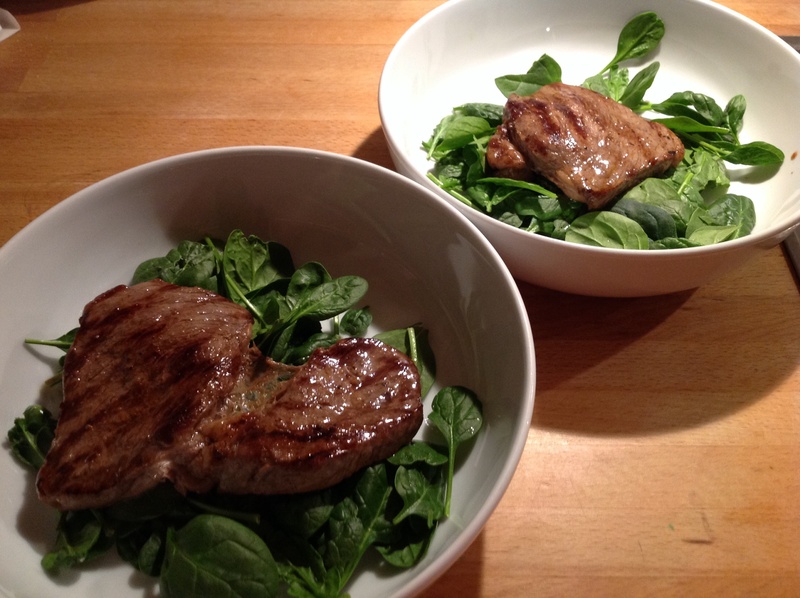 We just had rump steak as that’s what I had in the freezer and I served them with spinach as I still have nearly half a bag left! This was good, simple and tasty. I did drizzle a bit of vinegar over the spinach which was a nice touch. Wipe the apples and make a shallow cut through the skin around the middle of each. Core the apples and stand in an ovenproof dish. Pour a few tablespoons of water round them, fill each with sugar and top with a small knob of butter. Bake at 200 for 45-60 minutes. 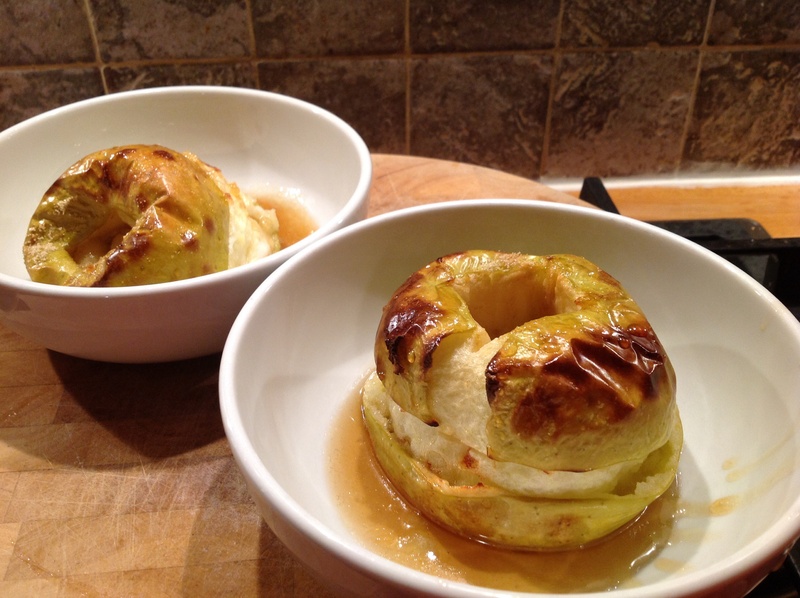 I remember having baked apples as a pudding when I was a child, I also remember not liking them. I remember thinking how can this be a pudding, it’s fruit! My mum did put sultanas in them which would’ve been nice. Overall it’s been a better day for food. Most of the meals don’t really seem like diets. I know I deviated again but it is difficult to stick to something so exact like this, especially working full time! Eggs are featuring in this diet a lot, I guess they are healthy and filling but I have had my fill of eggs! Before I started this I hadn’t eaten an egg in years, I’ve pretty much had them every day this week, and again for breakfast..
I’ve made scrambled eggs a few times for my daughter when she was much younger but I haven’t eaten them in years! Was not looking forward to breakfast as I’m sick of eggs, but actually these were ok. It’s maybe something to do with all the butter and salt I added but this has actually been the most enjoyable egg format so far! As for the fruit, didn’t see the point in stewing it, surely fresh fruit is better? Maybe it’s just for a bit of variety. I stewed some pears as they were looking distinctly over ripe, not supposed to add sugar so added some ginger instead. Was ok.
Well I had none of these for lunch! Didn’t have time to make meatloaf just for lunch. Also I am still working through the bottomless tub of cottage cheese! I did make the coffee junket but had that after dinner instead. Warm the milk to blood heat and stir in the sugar until it is dissolved. Add the rennet, stir, pour the mixture at once into serving dishes and put in a warm place to set. Chill before serving. 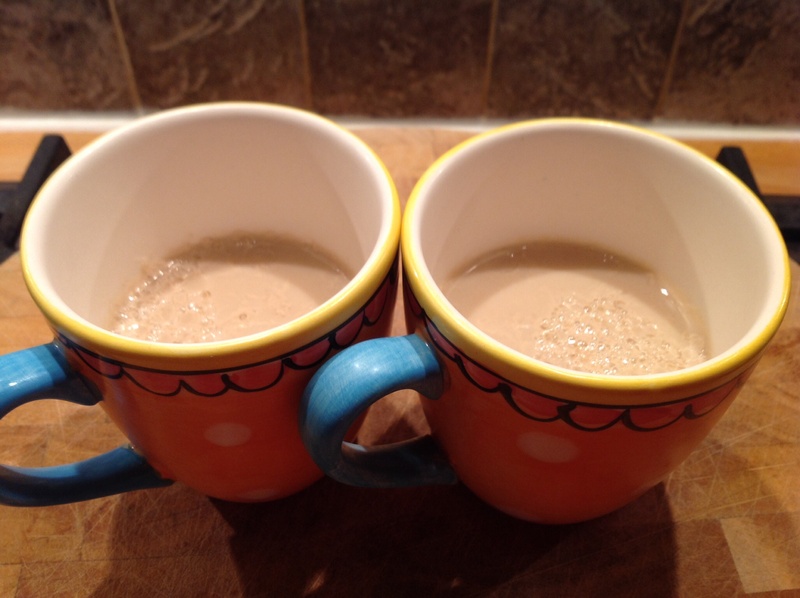 To make it coffee flavour replace some of the milk with strong back coffee. So rennet is apparently made using an enzyme taken from the digestive juices of a calf! Sounds utterly revolting! I went on a hunt for the stuff and came across vegetation essence of rennet thankfully. I made this last night and had expected it to be nicely set by tonight, it wasn’t. Not sure if it has something with the rennet; the stuff I bought is called essence of rennet rather than just rennet. It tasted ok but was a really unpleasant texture, so didn’t finish it. I stuck to this a bit, well I only omitted the cauliflower. I mean who on earth wants to eat cauliflower just boiled as it is! No thanks. 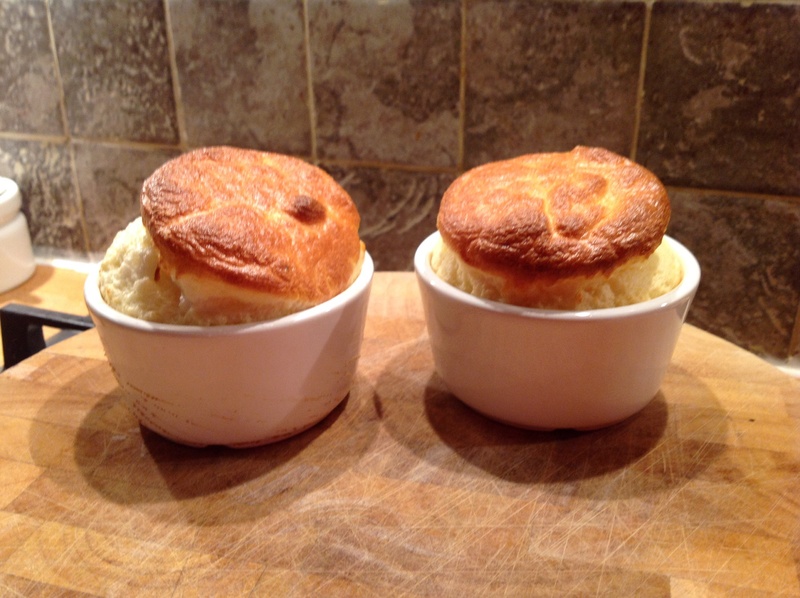 So I just made the soufflé for dinner (plus I shared bangers and mash with my daughter!) which was a recipe taken from the eggs chapter and I was looking forward to making this. Melt the butter, stir in the flour and cook for 2-3 minutes. Gradually stir in the milk and bring to the boil, stirring all the time. Cool slightly and add the cheese. Add the yolks one at a time, beating well, and season. Stiffly whisk the whites, fold these into the mixture and put it into the soufflé dish. Bake at 200 for 35 minutes until well risen and brown. I don’t have one big dish suitable for a soufflé so made individual ones. I had to assume doing this would mean a shorter cooking time, so I kept a close eye on them. I think I cooked them for about 12-15 minutes. These were utterly amazing! I had used a strong Isle of Mull cheddar, and the flavour was fantastic. I was really chuffed with the rise and the texture was gloriously soft. We both really really loved these. This has been the best dish this week by a mile! The best thing about today was the soufflé, the rest was pretty dull! Just had fruit as a snack again. Ok am actually get a bit fed up of this diet malarkey, but I hate to give in so going to carry on for the last 3 days. Have to admit to some serious cheating though! Not much to say about this, no quantities are advised so just had one tomato and few slices of ham. 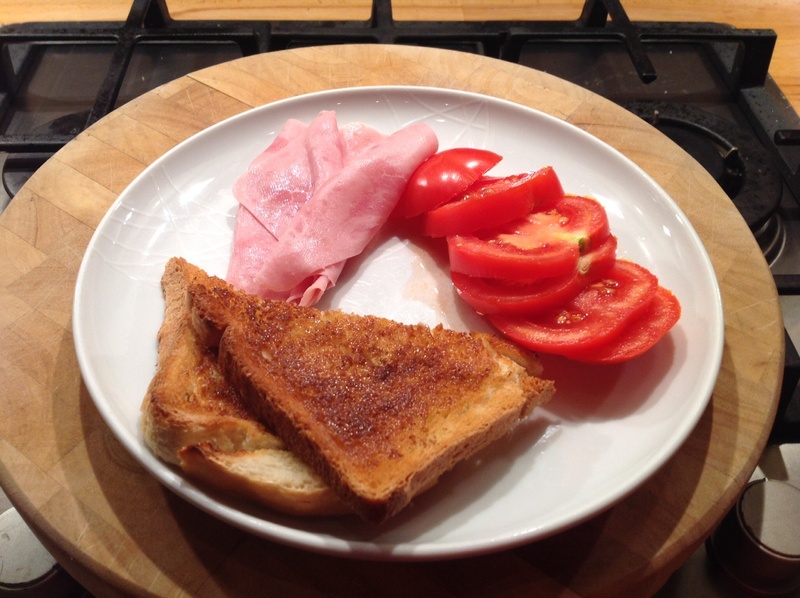 Also had toast rather than bread! Well I had none of this for various reason; didn’t have time to make a mustard sauce, didn’t buy watercress as I still have a big bag of spinach leaves, didn’t buy sauerkraut as it comes in a massive jar and didn’t want to waste any and also I still have loads of blinking cottage cheese left and I hate waste so had that instead! First off I have never made egg mayo! 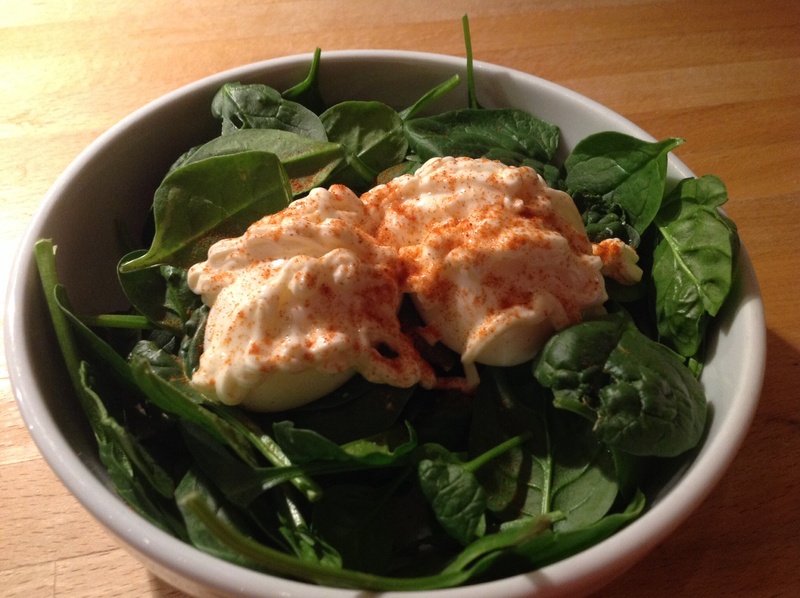 The recipe in the book suggests plenty mayo and cayenne pepper and then it’s best served on salad leaves. I went way overboard with the mayo and the cayenne. Also as I mentioned I have big bag of spinach to use up served it on that instead. As for the starch reduced rolls, no idea what they are or where I’d find them so I just had toast! Overall I’ve kind of given up sticking to this exactly as it is. I hate not finishing things so am going to see through the rest of the week. There were no real recipes today so think that’s why I’ve lost the motivation! Tomorrow I have few new recipes to try as part of the diet so will try be back on form tomorrow!! It is the kidney I really wasn’t looking forward to, it just looks like a kidney! I think I completely overcooked it! I really struggled to eat it and only managed a few bites, gave the rest to my husband. Not sure if it’s because I’ve lost my appetite slightly or I just don’t like it! 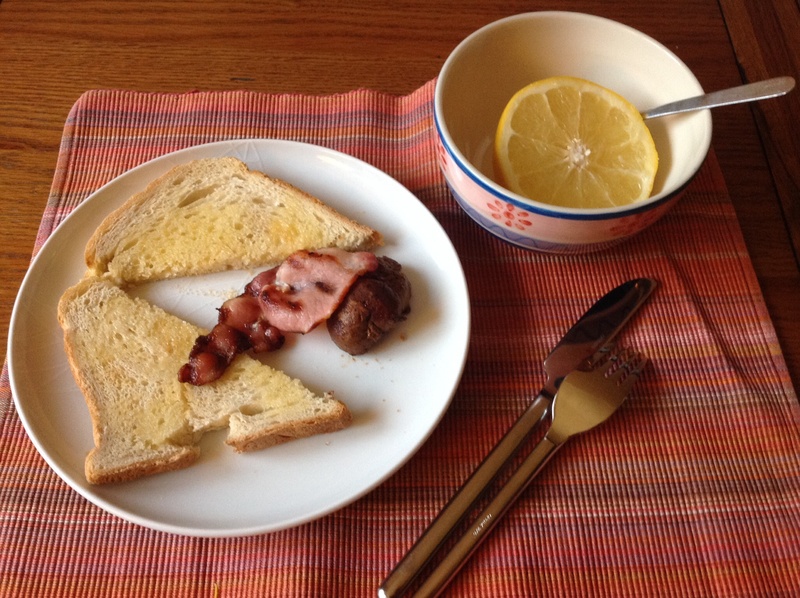 I managed the bacon and toast. Then there was something quite comforting about the hot grapefruit. So much so that I ended up having the whole thing! Cottage cheese is another of these things I remember my mum having loads when I was younger as part of her many diets! It doesn’t advise on quantities, I again wasn’t hungry so only had a few spoonfuls of the cottage cheese. Pretty sure you could eat an entire cucumber and not have to worry about calories! Place all the ingredients in a pan, bring to the boil and simmer for 5 minutes. Strain and serve. Simple! I thought this was quite delicious, but my fellow diners didn’t agree! It is very very thin as you would expect but I thought it had a lovely strong tomato flavour. I do prefer proper thick soup and to be honest I think a thicker soup is just as healthy, yes there is more calories if you use potato as a thickener. 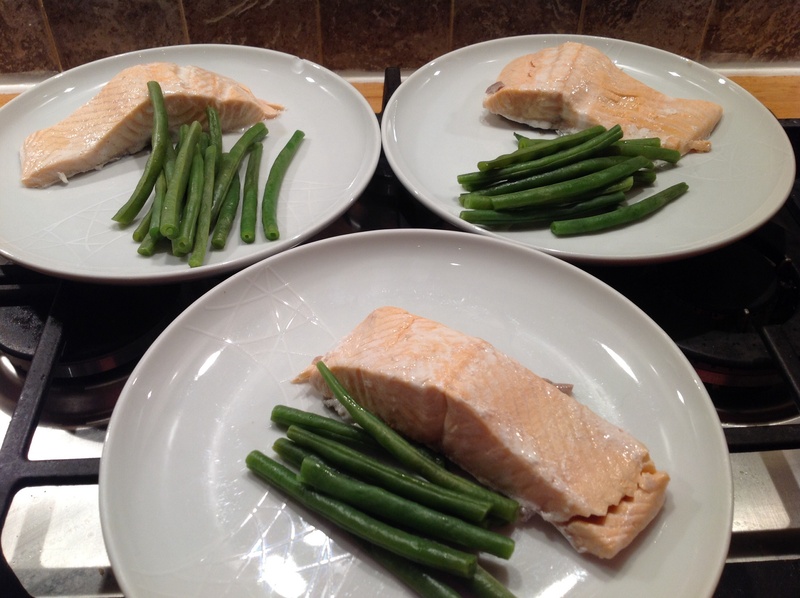 We just had salmon and green beans although we steamed the salmon rather than grill and steamed the beans as well. Was tempted to make a quick tartare sauce but was nice enough on its own. Not much to say about the yoghurt! It was nice enough. Overall another ok day. I’ve not had a great appetite anyway so not sure if that’s why I’ve not been hungry between meals and not had a single snack today. Am glad the offal related elements of the diet are over, not my favourite!